Amsterdam is obviously the perfect destination for a romantic weekend away. The countless canals, bridges and traditional buildings create a unique atmosphere. Are you planning to book a romantic weekend in Amsterdam with your loved one? Let me list all of my romantic recommendations here, so you can start planning a weekend you will never forget! A very important question for any romantic stay – which hotel will you be staying in? The bigger names like NH and the Hilton are, of course, good choices, but you should definitely look further afield. 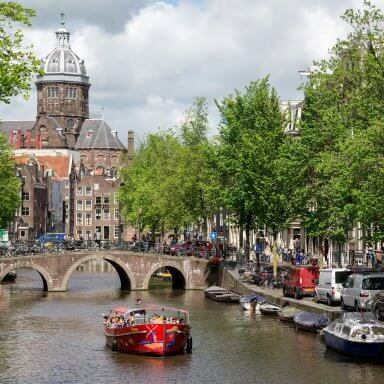 Find out more about the different Amsterdam districts beforehand. The Jordaan or De Pijp neighbourhoods are stunning, extremely romantic areas not too far from the centre of Amsterdam. Places such as the Rembrandtplein, Leidseplein or anywhere close to the Dam can be very busy and very noisy. Het Parool has a great overview of the busiest areas of Amsterdam. I am imagining that your idea of a noisy romantic weekend has very little to do with street noise, so don’t book somewhere without knowing more about the area. Personally, I advise you to look for a hotel near Jordaan or De Pijp, in my opinion the most atmospheric neighbourhoods of Amsterdam. In Jordaan you are still in a central location but far from the worst of the crowds. For more information about the Jordaan, or about any other district that might appeal to your tastes, I advise you to take a look at my page about the different Amsterdam districts. 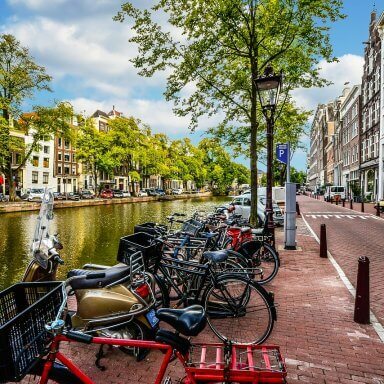 Amsterdam is full of fun things to do! First of all, rent a bicycle. Take a look at the bicycle rental page to find out the best (and safest) places to do this. The bicycle is the preferred means of transportation when in Amsterdam, especially if you are travelling with your partner. Public transport can be very busy and does not always run late into the night. It would be a shame if your romantic evening in Amsterdam had to end prematurely so that you don’t miss the last tram. By renting a bicycle, you are free to decide for yourself when your evening ends. Cycle along the romantic canals and become transfixed by the small twisting alleyways, steep bridges and numerous comfortable restaurants and cafes that you will encounter along the way. For the perfect end of an evening, have a drink at the Rembrandtplein, the Leidseplein or the Nieuwmarkt. Actually the list of places to end an evening is too long to put on a list, but one thing is for sure, you will have plenty of choice! Of course, you can not miss a boat trip (internal link) during your romantic weekend in Amsterdam. 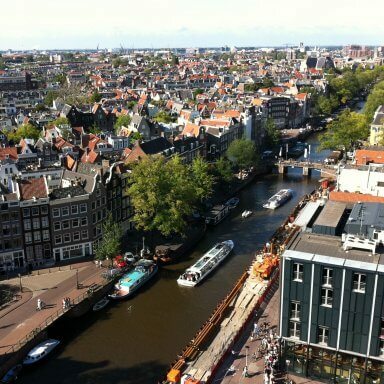 There is also a lot to do in Amsterdam during the day. On a beautiful summer’s day you can cycle to the Vondelpark for a picnic. With a bit of luck an open air concert in the park theatre will be playing and you can enjoy great music in the sun. In less perfect weather, visit one of Amsterdam’s many museums: the Rijksmuseum, Tropenmuseum and Van Gogh museum are my personal favourites! Of course, you can not miss a boat trip during your romantic weekend in Amsterdam. Book one for around dusk, when there is just enough daylight to still see the city in natural light, but at the same time enjoy the city lights. This is when Amsterdam looks its best! Do you want to up the romance? Rent your own sailing boat and sail around the canals of Amsterdam on your own. Spending a few hours together on the Amsterdam canals is very romantic. You are in the busy city centre, but can still experience tranquillity from the water. 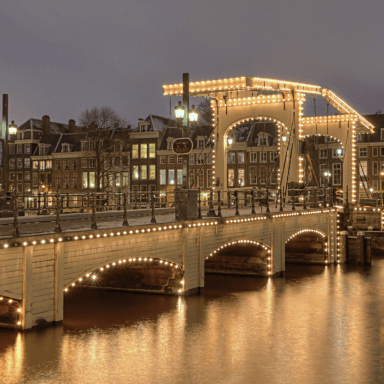 In the evening after dinner you can walk along the canals, towards the Magere Brug (bridge). This is beautifully lit and attracts many loving couples. It’s a beautiful setting for an incredible photo of you and your lover during your romantic getaway in Amsterdam. But wait! There’s even more you can do during a romantic weekend in Amsterdam. On the Floor17 Rooftop Terrace you can watch a movie in the evening. Take your seat on the roof and experience the very special ambiance that hangs in the air during these open-air movie nights with a cocktail and a bite to eat. If you want the complete ‘romantic weekend package’ when in Amsterdam, keep an eye on the hotel notice board. Sometimes they will organised some great days out. If you want to plan your trip carefully, I advise you to buy tickets in advance for most activities. This saves wasting time in queues, money and a lot of stress. Because the last thing you need during your romantic weekend is stress, right? 638 visitors rated Romantic Weekend in Amsterdam average 4.58 stars out of 5.